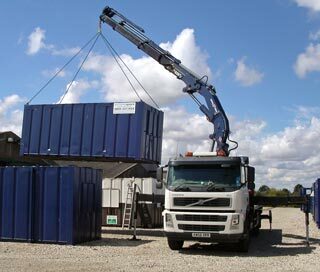 We specialise in moving portable buildings, plant and machinery. 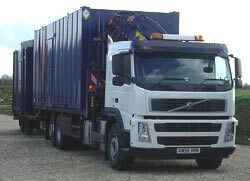 Trained drivers safely lift up to 6 tonnes in weight at 5 metres or 1.8 tonnes at over 14 metres.Cabins up to 44ft in length can be loaded and moved using our vehicles. 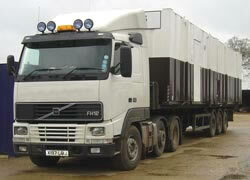 For very heavy loads over 5 tonnes we can arrange loading using a mobile crane. Using our beaver tail rigid and articulated low loader we can also move wheeled and tracked plant and equipment up to 18 tonnes. 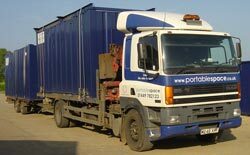 We can quickly mobilise large numbers of staff for manual loading or we can deliver other loading equipment including rough terrain telescopic handlers, skid steer loaders or industrial forklifts for use on site. This service is of particular interest to liquidators, auctioneers and businesses concerned with recovering assets from premises. The diagram below shows the recommended minimum chain lengths to minimise damage and safely lift different sizes of cabin.